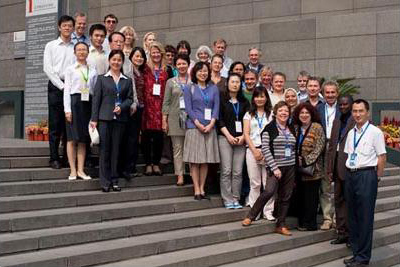 The 34th Meeting of Directors of ISSN National Centers was held in National Library of China during September 14th to September 18th of 2009 shortly after the library celebrated its centennial birthday on September 9th. Over 30 delegates from 25 countries attended this meeting, during which directors of ISSN national centers and library professionals around the world had many in-depth discussions, view exchanges and experience sharing. Among issues on the agenda, the implementation of ISSN-L and ISSN assignment policy such as Criteria for the Selection of ISSNable Integrating e-resources and ISSN projects PEPRS received the highest concern. ISSN (International Standard Serial Number) is an eight-digit number which identifies periodical publications, including electronic serials. The ISSN database, ISSN Registry, is the most comprehensive and authoritative source for the identification of serial publications world-wide. The number of records in the ISSN Register totaled 1,450,268 (including current and dead) by August, 2009. ISSN China Centre was established in National Library of China in the year 1985. Through years of efforts, the number of serial records in CNMARC format in the ISSN China Centre database totaled 13,100 by June, 2009, which covered almost all records for periodicals officially published in mainland China and some bibliographic records for almanacs. ISSN China Centre has signed agreement concerning access to ISSN China Centre records with the world-renowned information service provider ProQuest, which further promoted the application of bibliographic records of Chinese serials to an international level. ISSN has been applied to many fields. ISSN is used in libraries for identifying titles, ordering and checking in serials, and claiming missing issues. ISSN simplifies interlibrary loan and cooperative cataloging workflows. Employed as a standard numeric identification code, ISSN can be used in computers for updating and linking files, for retrieving and transmitting data. ISSN also provides a useful and economical method of communication between publishers and suppliers, making trade distribution systems faster and more efficient. ISSN results in accurate citing of serials by scholars, researchers, abstracters, and librarians. The ISSN Directors' Meetings are technical meetings, held on annual basis, which provide an opportunity for members of each ISSN national centers and the International Center to discuss issues related to the assignment and management of ISSNs, learn of new developments and harmonize the practices of the various ISSN national centers. The meetings are held in a different country each year since 1974, hosted by one of the ISSN national centers. It is the first time for ISSN China Centre to host the meeting after the ISSN national centers of the U.S., France and Switzerland, etc. as hosting organizations. Recently, new types of resources such as continuing electronic resources are constantly emerging as the rapid development of digital technologies, which poses new challenges to ISSN assignment and management in many countries. This meeting will facilitate exchange and cooperation between ISSN China Centre and other ISSN centers, keep ISSN China Centre informed of the latest development of ISSN, which in return, will promote the ISSN assignment and management in China. 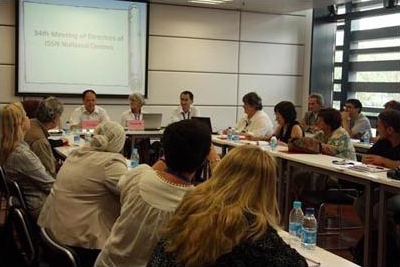 On April 23-25, 2008, the 17th Plenary Session of the ISSN International Center and the 52nd/53rd Session of Governing Board (Council) of the ISSN International Center were held in Paris, and Gu Ben, director of the ISSN China Center, attended the sessions. The 17th Plenary Session introduced the published ISSN standard (ISO 3297) and discussed the start of ISSN-L. The session also reported the continuing increase of the ISSN records (especially the electronic resources) and increasing growth of the sales of the ISSN records. The session believed that as the organization had had 84 national centers, it should steady develop in accordance with the 2006-2012 Center Strategic Plan. The session also put forward four new tasks, including training work, the situation awareness, service standard and ISSN Award establishment. The session elected the new international council, supplemented Vietnam and Tunis as the members of the council. ISSN China Center was elected as the director of the new council again. The new chairman of the council was the representative of the National Library of Germany, and the vice-chairman was the representative of the National Library of Finland. The council suggested modifying the chapters so as to solve the problem that some countries could not enter the council. The 17th Plenary Session also defined that the Meeting of Directors of ISSN National Centers would be held in Beijing from September 14-18, 2009 and be listed as one of the 100th anniversary serial activities of the NLC. On April 24-26, 2006, the 16th ISSN General Assembly was held at the headquarters of UNESCO in Paris, France. 46 representatives and observers from 32 national and international organizations presented the conference, and Mr. Wang Zhigeng, director of ISSN China Center, attended the conference as well. This is a very important conference held by the ISSN organization for facing the challenges of digital publication and network publication and discussing the problems of the continuing resource unique identification and linkage under the international background that the intellectual economy is just unfolding. The conference heard and passed the Working Report of Governing Board 2004-2005, Working Report of ISSN International Center 2004-2005 and Working Report of ISSN New System Project Group. The conference also discussed a plurality of key problems, including ISSN Strategic Plan 2006-2012 and Amendment of ISSN International Standard (ISO 3297), and passed Distribution Solution of Annual Membership Fee 2007-2008. Finally, the conference elected the new international council, and ISSN China Center was successfully elected as the new council director. It is reported that every term of office of the ISSN International Council is two years, consisting of one host representative, one UNESCO representative and ten national centers, who are elected by a majority vote from the General Assembly. The ISSN International Council has important responsibilities in the ISSN organization, and it is responsible for guiding and monitoring the international center and national centers to carry out activities under the principles developed by the General Assembly, passing annual budget and temporary budget, and providing expert consultation, professional guide, assistance, etc. to the institution members.